Eastern Marine has available a large selection of RV storage covers. We have a range of covers available for a variety of RV’S, including class A, B and C. As well as 5th wheel, toy hauler and popup or truck camper covers. 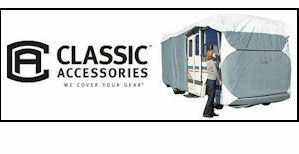 We also stock a large selection of RV accessory covers. We stock a selection of three different Classic Accessories covers. They are categorized by three names, the Poly Pro 1, Poly Pro 3 and the Perma Pro. They are all similar but offer a number of additional benefits as you move up the line. The Poly Pro 1 is Classic Accessories entry Level RV Storage cover. It is a 1-ply non-woven Polypropylene Fabric. Polypropylene is a versatile thermoplastic material. It is low density, chemical and thermal resistance and is excellent for use as a moisture and oxygen barrier that also happens to be fully recyclable. It is well suited for use as a weather resistant cover. The Poly Pro 1 is backed by a 1 year manufacturer’s warranty from the date of purchase. The poly Pro 3 is similar to the 1 but more durable. It uses the same reliable polypropylene fabric however; it has a 1-ply non-woven sides and 3-ply non-woven tops. This ensures better durability to the cover and this is reflected by a manufacturer’s 3 year warranty beginning at the date of purchase. The Perma Pro uses a 100% woven polyester rip stop fabric. Polyester is a durable synthetic fiber that is flexible and resistant to wrinkles and shrinkage. During the weaving of the tarp, thick, reinforcing threads are interwoven at regular intervals in a crosshatch pattern. This provides excellent resistance to tearing and abrasion. The Perma Pro carries a limited lifetime warranty through Classic Accessories.